A group of Michigan Tech students has developed a three-week challenge focused on reducing the use of single-use plastics and other plastic items. The topic of plastics use has been in the news quite a bit lately, especially focusing on the implications of changing global recycling patterns of plastic, and the impacts that waste plastics can have in the environment. For a variety of reasons, it’s a good idea to reduce our use of many types of plastic! If you are interested in participating in the series of plastic-themed challenges, from near or far, you can find more information on the ‘Plastic Free Challenge’ on this Facebook link! Michigan Tech has ambitious plans to address the future of education, the contexts in which education operates, and the objectives and aims that a University education serves, given the expected disruptions resulting from external factors (you can read more about Tech Forward here). Discussions and meetings in the fall 2018 semester (you can read more about that process here) resulted in the announcement of big, broad Initiatives intended to create plans for proactively addressing the challenges faced by MTU, Universities, and the societies in which we live. One of the Initiatives is focused on Sustainability & Resilience, and the Working Group has been meeting regularly to discuss possibilities, priorities, and the principles that should guide Sustainability & Resilience activities at MTU — What do you think? What do you think Sustainability & Resilience should look like at MTU? Faculty from social sciences, engineering, and computer sciences at MTU, in partnership with colleagues from institutions across the US and the Netherlands, have recently been awarded researching funding from the National Science Foundation’s new program on Innovations at the Nexus of Food, Energy, and Water. We will be examining ways to model, communicate, and potentially change consumption behaviors impacting food, energy, and water resources in residential homes. You can read a bit more about the project here. This project involves several opportunities for funded PhD research assistantships, two in Environmental and Energy Policy at MTU (read more about how to apply here), and one social scientist located at Rutgers. We are excited to begin this important work researching ways of changing behaviors and understanding impacts to make our lives at home more sustainable! Global sea level rise has long been a predicted consequence of global warming, as massive ice sheets at the poles and on mountaintops pour their melted water into the sea. (Pumping groundwater out of aquifers and onto land (which then ultimately drains into the sea) is also a culprit.) Coastal cities are already bearing the brunt of sea level rise, from aquifer incursion (making water too saline to use) to overwhelming sea walls and stormwater infrastructure. Sea level rise is a growing threat to one of the oldest European settlements in North America. Founded by Spanish settlers in 1565, St. Augustine FL is now struggling to protect its heritage sites in the midst of profound state-level denial and delay. The likelihood of the city surviving another 450 years seem very slim. Of course, it isn’t helpful that these challenges are often overlooked in academic circles; a recent call for papers for an Urban Heritage conference has no mention of the impacts of climate change on ancient coastal cities, even though the majority of urban populations live along coastlines. Urban heritage preservation in the face of climate change impacts (floods, droughts, intense weather events, and others) will be an important area of work in the decades ahead. Is climate change mobilization the best we can do? On September 21st, an estimated 400,000 people gathered in New York City for what is being hailed as the “largest climate march in history.” Organized by the organization 350.0rg and dubbed “The People’s Climate March,” this event drew hundreds of thousands of individuals from around the world, representing a diverse array of organizations and groups affected by climate change, from indigenous groups to labor unions, as well as involving those who think they have some solutions, like renewable energy advocates. Celebrities of all kinds, from actors to politicians, attended the event and brought even more public attention to it. The event already has a wikipedia entry, and the organizers claim that 2,646 “solidarity events” in 162 countries also took place that day. This kind of social movement mobilization is meant to draw attention to the public outcry about environmental issues, specifically climate change. By gathering such a mass of people together, the event is meant to indicate that there is large scale public concern about climate change and public support for policies and actions that mitigate the environmental damages being caused by our consumption, particularly of the fossil fuels that contribute to changes in the global atmosphere. Yet therein lies the irony: people used commercial airlines to fly from across the country and around the world to participate in an event meant to draw attention to the damaging consequences of fossil fuel consumption. According to The New York Times, people came “from as close as the Bronx to as far as at least Rome.” The photo slideshow on The New York Times website highlights an art installation of melting ice, obviously intended to draw attention to the melting of glaciers already taking place as a consequence of climate change. Yet did those artists consider the fossil fuel consumption necessary to make their art sculpture? It would be complicated indeed to calculate the environmental footprint of “the largest climate march in history” – although I suspect it would be quite large. Even though events took place in other locations, many people choose to travel to New York to participate in the big event. For me, this raises an important question: is mobilization the best we can do? Social movement scholarship suggests that we need these kinds of large scale public events to draw attention to an issue, to demonstrate public awareness and support for social change. Yet, in the specific case of climate change, how can we mobilize without further contributing to the relatively mindless consumption of fossil fuels that has become such an engrained part of our society that we may fail to see the contradiction in flying from California to New York to protest climate change? What if all the people who attended that rally simply gave up the largest contributors to climate change, like fossil fuel powered transportation and agriculture? Can we mobilize with more intention, to demonstrate the possibility of living within responsible limits in the face of climate change? How can we balance the need to mobilize for change with a need to simply, as Ghandi aptly taught, be the change we wish to see? Now that it is summer, I finally have some time to write about papers published this year that have been quite interesting. I’ll start here first with one published by Lin et al. in PNAS back in February that sought to calculate how much of the air pollution that wafts over to the US from China can be attributed to the stuff we buy from them…. that is, the pollution that is produced through the production of plastic do-dads and other things that we import and consume here. The authors looked at sulfur dioxide (a precursor to acid rain), nitrogen oxides (potent greenhouse gases), carbon monoxide, and black carbon (also implicated in climate change). In total, they found that “about 21% of export-related Chinese emissions were attributed to China-to-US export”, indicating that one-fifth of their air pollution is driven by our consumption of their goods. As for the pollution that wafts over to the US, Chinese pollution was sufficient to cause at least one additional day of ozone levels that violated US standards from Los Angeles to the eastern seaboard. In particular, a substantial proportion of sulfate pollution measured in the western US was attributable to Chinese exports. Quite a few years ago, my colleagues and I wrote about the way that international trade can complicate consumption impacts on the environment…. specifically how the international wood trade can hide the link between wood consumption and deforestation. One of the consequences of our increasingly international economies is our growing blindness to how we impact our environment (which is now global as well). Prior to the Industrial Revolution, production and consumption were mainly local to regional; product availability was closely tied to regional weather, soil, and human labor. Prices could reflect these conditions and overall supply, including how that supply impacted the quantity and quality of resources such as water, air and soil. Now that our economy has globalized, we need to find better ways to allow product data and prices to once again reflect the environmental capacity of the system, so that we can better understand the impacts of our consumption. Lin et al.’s paper nicely illustrates why we should care about pollution in China; our environments are as connected as our economies, and negative environmental impacts elsewhere have a way of “boomeranging” back to us. The US-IALE conference in Anchorage was short but sweet — great science, wonderful colleagues, and new ideas. However, as picturesque as the setting was, it was deeply unnerving. This winter was one of the warmest on record for Alaska, and indeed for much of the past winter, Alaska was warmer than much of the eastern US. When I arrived in Anchorage, it was at least 20 degrees (F) warmer than Houghton had been, and the trees were already fully leafed-out and blooming. Several wildfires contributed to a haze around the city that marred views and made our clothes smell like a campfire; the fire season started early and is expected to be a severe one, thanks to warm weather and dry conditions in the forests. 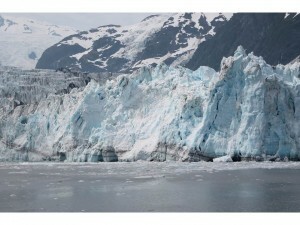 My son and I went on a glacier tour…. truly impressive! The blue hues and striations of black sediment made them far more beautiful than I had imagined. As we watched one of the glaciers calving, I wondered if any of those glaciers would be around for my son to show his children; odds are against it. Many speakers at the conference spoke of the difficulty that our “no analog” future presents us when we try to develop management plans for our ecosystems more than a few decades out. While they were talking about the vast reorganization of species and ecosystems that we are likely to see, I thought about how I might describe things like glaciers and tundra to my grandkids….. I am certain that my words, and even my photos, won’t do them justice. I’m live-blogging this week from the US-IALE conference in Anchorage Alaska….. a lot of great discussions going on here! Brian Czech from the Center for the Advancement of the Steady State Economy gave our plenary talk this morning about sustainable natural resource management and ecological economics. He cautioned us to be mindful of the words we use, particularly development vs. growth. Growth implies that an increasing amount of natural resources will be used over time, and the economy will expand. Development, on the other hand, allows for maintaining natural resource use at current levels, but changing how we use them (e.g., more efficiently and effectively). Just an hour later, a presenter discussed how the Bureau of Land Management sets and works towards landscape management goals for the Prudhoe Bay area, including “sustainable economic development of natural resources”, however it became clear that BLM is really referring to “sustainable economic growth”. Brian was on-hand to point out the vast policy implications of this terminology choice; a very instructive lesson!